Being stuck in the USSA is something like a worst nightmare for me, yet an influx of people have supposedly been trying to get into the home of the slaves. I recently caught up with my friend Luke Rudkowski before leaving the land of the fees. We were both in Sedona, Arizona (a beautiful place nonetheless) to speak at the inaugural Anarchizona. Luke and I had a chance to break down the latest immigration hysteria, political myths, and fake news for his popular channel We Are Change. Also avocados! 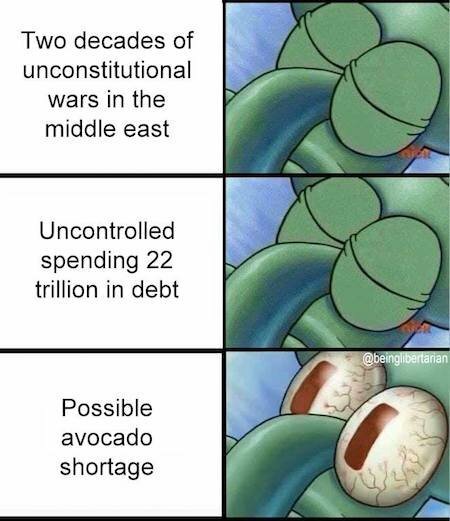 Do people really believe that if they completely shut down the Mexican border, the only noticeable difference would be a shortage of avocados? Or is that just what it takes to get the outrage-crowd to pay more attention? Mexico and the US are massive trade partners. A shutdown in trade would possibly be the largest single event in economic history. At the very least it’d certainly rank up there. It’d be over $600 billion in trade wiped out with a single wave of the Orange Fuhrer’s hand. If the border really closed, Mexican goods such as automobiles, electronics, oil products, silver, various fruits and vegetables, coffee, cotton and much more would rise in price dramatically in the states, or even become unavailable. “Why is this gringo running to Mexico before the Trump border closing?” asks Rudkowski. In a free society, immigration is simply called moving. At the recent TDV Summit, leading experts covered the best strategies for investing, expatriation, privacy, internationalizing of assets, Perpetual Traveler (Prior Taxpayer) lifestyles, and more! Many of our speakers spoke about expatting and living in much freer, more affordable and enjoyable places such as Mexico. If you couldn’t join us this year at The World’s Premier Liberty Event, don’t worry, we’re bringing it all to you! Get access to the exclusive on-demand HD videos of each presentation at Anarchapulco.com today. You can unchain yourself from anywhere.